Chicago Heights, IL-(ENEWSPF)- Marian Catholic High School invites 8th grade students to take the entrance exam on Saturday, January 12, 2013, at 8:00 a.m. in the Sr. M. Paul McCaughey, O.P. Leadership Center. Elizabeth Johnson, a freshman from Orland Park, has found that being involved in band and art club has made the transition to Marian Catholic easy and enjoyable. 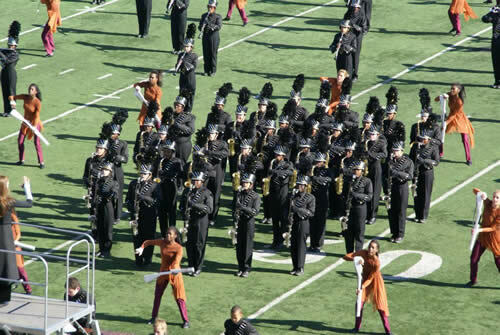 “A highlight so far at Marian Catholic has been performing at the Lucas Oil Dome in Indianapolis for the Bands of America Grand Nationals,” Johnson said. At Marian Catholic, 90 percent of the student body is involved in an extra-curricular activity. The variety of athletics, fine arts, and clubs that are offered at Marian Catholic permit students to find an activity that is the right fit providing them with an enriching high school experience while encouraging them to maintain the high academic standards that has been the hallmark of Marian Catholic. Last year, students in 19 out of 24 varsity athletic teams averaged a 3.4 GPA. Creating an environment of excellence is a priority at Marian Catholic. While for some families, providing an elite college prep Catholic education for their student may require a financial sacrifice, Marian Catholic has a wide range of scholarships. In addition, in an effort to maintain a student body of academic distinction, Marian Catholic offers academic scholarships to incoming freshmen who score at the 90th percentile or above on the entrance exam. Scholarships range from $2,000 to $8,000, depending on the student’s score. Students who receive Entrance Exam Scholarships are still eligible to apply for additional scholarships. In addition scholarships are offered to incredible students who excel in various areas of school life. Please being two number two lead pencils and a $25 dollar test fee. No calculators will be allowed. For further information regarding the MCHS Entrance Exam contact Sr. Dorothy Marie, O.P., at 708-756-9762 or [email protected]. For more information about the Scholarship Program please contact Sister Judine Hilbing, O.P., President of Marian Catholic, at 708-756-9403 or [email protected].